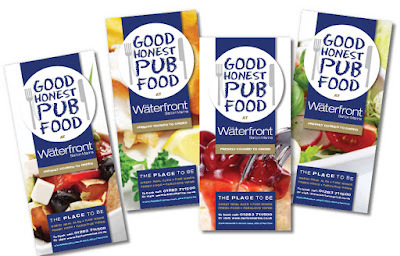 The Waterfront at Barton Marina is championing Good Honest Pub Food. They asked us to create these mouthwatering designs, a 'sweet' of six in fact. We've created a strong and distinctive but friendly brand that is designed to work well with an array of colourful food photography. They're definitely satisfying our creative appetites. Further to a recent email question, I thought I'd clarify the difference between a JPG file and a vector .EPS file. A lot of people may not be aware that there is a difference which can have a significant impact on creative work. A JPG (or "JPEG" is an acronym for the Joint Photographic Experts Group which created the standard) is a bitmapped file (ie it is made up of lots of pixels) and as such cannot be scaled with clarity beyond a certain size. Invariably a JPG is also created in RGB and not Pantone colour. A JPG file is often used by PC users because they can 'open' these and cut and paste them into Word and other such applications. A vector file (usually .EPS format - Encapsulated Postscript File) is a mathematically described digital image and is constructed from points and vectors (ie lines joining point to point and often filled with a colour) A vector file can be scaled to any size without loss of clarity or sharpness because it is not made up of pixels. Creating proper vector files takes time, skill and knowledge. Most logos created in vector format are built in Adobe Illustrator (AI) or Freehand (old school) or shock horror - Corel Draw (if it still exists!). Some logos have a picture which forms part of the logo - for example a lot of old rugby clubs and football clubs have branding which often have 'crests.' These can look ok but rely upon having a very large format bitmapped image of the crest - which explains why they often print badly. It is possible nowadays to create a vector file of most crests but most people do not know how to do this. This is why larger clubs have invested in simplifying their brands so that they can have merchandise created more easily as well as easier brand policing. These can still be created in standard applications such as Adobe Illustrator, because its possible to 'place' a bitmapped image into the file. So some .EPS files can have a bitmapped image within them - again this is not to be advocated for reasons of scaling/bitmapping. Any logo which has a FONT included is not really fit for purpose. Any font used within a logo should be converted to paths (ie Vectorised). The reason for this: a font can be changed or substituted (which can happen if the receiving party does not have the font installed on their system) - it is not uncommon for magazines and publishers to do this - resulting in a logo that prints incorrectly. The issue for PCs user being, that Word does not support the importing of EPS files. However it is possible to import a JPG file into Word - which is why a lot of people have to do this. They then send the JPG around to everyone they know telling them that this is the logo artwork - which it really should not be. ...And another thing - Word converts the JPG file into a Windows metafile - this is effectively a screen image of the original file, which is EVEN WORSE! It is not uncommon for people to send a Word document which contains their 'logo' for others to cut and paste into their collateral. This perpetuates the myth that Word is great for printing corporate stationery and the like...which for far too many reasons to list, it is not. Its also worth noting that Word for PC does not support CMYK (as in, you cannot select or create a CMYK colour, but you can choose an RGB colour or an HSL colour), making the use of Word for corporate stationery even more un-fit for purpose. (Bizarrely in Word for the Mac, there is a CMYK selector - a strange decision by Microsoft!). To summarise - it is worth researching just how you want your brand to appear to others - if you do insist on using Word to print your stationery then you are at the whim of paper type, printer type, ink type, and PC capabilities. You also cannot bleed your image off the page (due to printer limitations) If you are happy with this then fine - but at least you'll be aware of the possible pitfalls and limitations of that this choice gives you.